Quality assurance schemes for compost and digestion residuals established themselves in the last 20 years successfully in various European Member States and contributed well for the sustainable recycling of organic waste. Nevertheless the running revisions of various environmental and agricultural directives at the Commission and the EU’s free trade principle advice to develop consistent quality standards for compost and digestion residuals. The example of the advanced countries clearly shows that effective biowaste treatment has to include quality standards and their control in order to guarantee environmentally safe application and successful marketing and markets. On the basis of existing experiences in countries with running quality assurance schemes the European Compost Network ECN developed a European Quality Assurance Scheme (ECN-QAS) for compost and digestate. With this project ECN e.V. takes the initiative to build up an European-wide Quality Assurance Scheme (ECN-QAS). In the first stage national quality assurance organisations (NQAO) should be certified by ECN-QAS. Secondly, composting and anaerobic digestion plants - monitored by national quality assurance organisation (NQAO) and recognised by ECN-QAS - should have the possibility to apply for the quality label of ECN-QAS in addition to their product quality label or certificate of the national quality assurance organisation (NQAO). 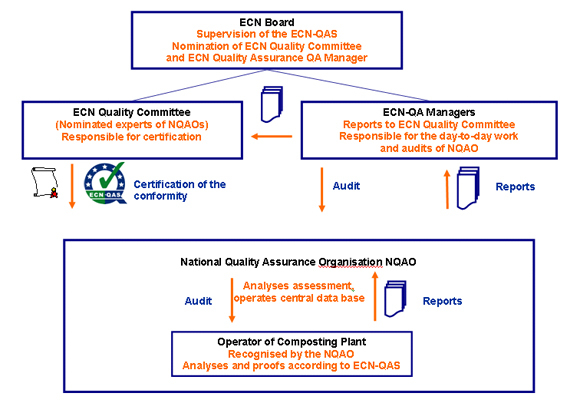 The ECN-QAS presents an independent quality assurance scheme and includes fundamental requirements for national quality assurance organisations (NQAO) for compost and digestate and basic requirements for an European compost and digestate standard in the first instance. Besides a positive list for suitable input materials and requirements for process quality also quality criteria for compost and digestate are laid down in the scheme. The requirements for conformity assessment of national quality assurance organisations (NQAO) to the ECN-QAS. Regular assessment of the production in the plants by the national quality assurance organisation (NQAO) by means of process requirements. Regular sample taking and analysis of the final product from independent, acknowledged labs and additionally the evaluation of the results by the national quality assurance organisation (NQAO). Documentation by the national quality assurance organisation (NQAO) with information about the quality properties of the product, legal requirements, the necessary compost and digestate declaration and information about use and application rates according to good practice. Awarding of the ECN-QAS Conformity Label to national quality assurance organisations (NQAO). Awarding of a quality label for composting and digestion plants and compost and anaerobic digestate products by a conformity assessed national quality assurance organisation (NQAO) in respect to ECN-QAS.